If you find yourself coughing up bloody mucus, it can be very scary. When you spit up blood or bloody mucus from the throat or lungs, it is referred to as hemoptysis. It could mean a serious underlying health condition such as cancer, blood vessel problems, lung problems or infections. Sometimes there can be sputum which is little blood tinged, and this is something you don’t need to worry about. If a foreign body gets lodged in the airway, it can cause damage and result in coughing up bloody mucus. For example, small children can get toy parts or peanuts in their respiratory system. Sometimes the redness in the spit may not be due to the presence of blood. It could be caused by candies, wine, beetroot and drinks with artificial color. Trauma like gun shot or motor accident to the lungs can cause the symptom, too. Tuberculosis of the lungs, bronchitis and pneumonia can often cause the presence of blood in the mucus. In fact, an infection in any part of the respiratory tract can cause the blood to mix with the mucus. Along with hemoptysis, there will be fever and cough. The symptoms will resolve once the infection clears. The cells lining the bronchi of the lungs are usually affected by cancer. Coughing up bloody mucus is one of the earliest signs of it. Lung cancer is seen usually in people over the age of 50 and mainly in smokers, though it can be seen in nonsmoking and younger generation as well. Bronchiectasis occurs when there is abnormal widening of any airways with extra mucus. Coughing with lot of sputum is the primary symptom. Small amount of blood is seen with the mucus and there can be more blood. It is mainly due to previous lung infection or inherited condition. This is a very serious and life threatening condition. It happens when there is a blockage in the blood vessels of the lungs. It results in breathlessness, chest pain and coughing up bloody mucus. This can lead to the build-up of fluids in the lungs, causing breathlessness. The sputum becomes frothy and blood stained. Certain blood vessel disorders can also cause bleeds in the lungs and airways. Some conditions can cause inflammation and abnormal tissue deposition in the lungs, resulting in hemoptysis. Examples are pulmonary hemosiderosis, Wegener's granulomatosis, lupus pneumonitis and pulmonary endometriosis, Goodpasture syndrome and broncholithiasis. People suffering from asthma can have pink colored saliva if there are a large number of eosinophils. If you are taking anticoagulants like warfarin, rivaroxaban or dabigatran which stop the blood from clotting, it can lead to hemoptysis, too. Sometimes it is caused by a bleeding vessel which stops by itself. In some people with hemoptysis, there is no cause found, despite conducting tests and is referred to as idiopathic hemoptysis. 1. You have bloody mucus for more than a week, the intensity or severity of it increases or it occurs intermittently. 2. You see blood in the urine or stools as well. 3. You have chest pain and/or fever of 101 °F or higher. 4. There is unexplained weight loss or loss of appetite. 5. You experience shortness of breath even with regular activity. 6. You have soaking sweats at night. Treatment for such conditions is usually done at the hospital till the causative factor is determined and there is no immediate threat of serious bleeding. In this procedure, a catheter is passed through an artery in the leg to the lungs. The source of bleeding is found out by using artificial dye and checking on the video. Metal coils or other substance is used to block the artery. Other arteries compensate for the blocked artery. This procedure involves using tools that are attached to the end of an endoscope to stop the coughing up of blood. It can be done by using an inflated balloon that is attached at the end of the scope. 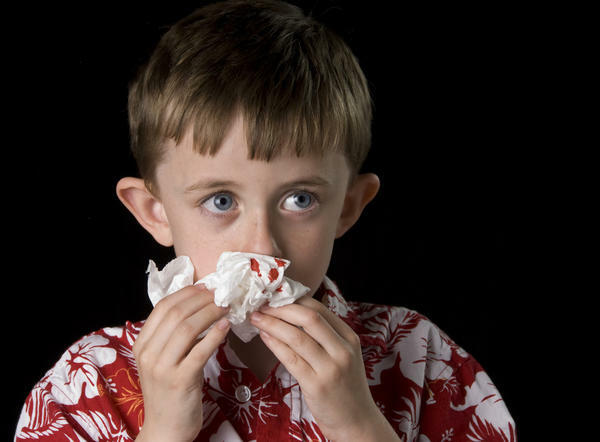 If coughing up bloody mucus is serious, it could become life-threatening. Surgery may be required to remove certain parts of lung so that the underlying cause for hemoptysis is corrected.